Picked up our relocation campervan. .. OMG. Instead of a 5 berth it was a 9 and 30 ft long! Luckily Danielle has truckers genes and was able to get us on the road :). Our first stop for the night was a lovely little place called Carmel and we parked the RV in a lay by next to the road on one side and the beach (Carmel by the river) on the other. We’re not too sure we’d recommend this as a place to sleep as the road was so noisy and every time a car went past at speed it felt like we might topple over. However! It’s a great spot for a rest stop and for a stroll on the beach :). Next morning we carried on south on the PCH taking in more of the beautiful scenery. The roads really started to wind and we spent a lot of the time on what felt the the edge of a cliff. A really stunning drive! 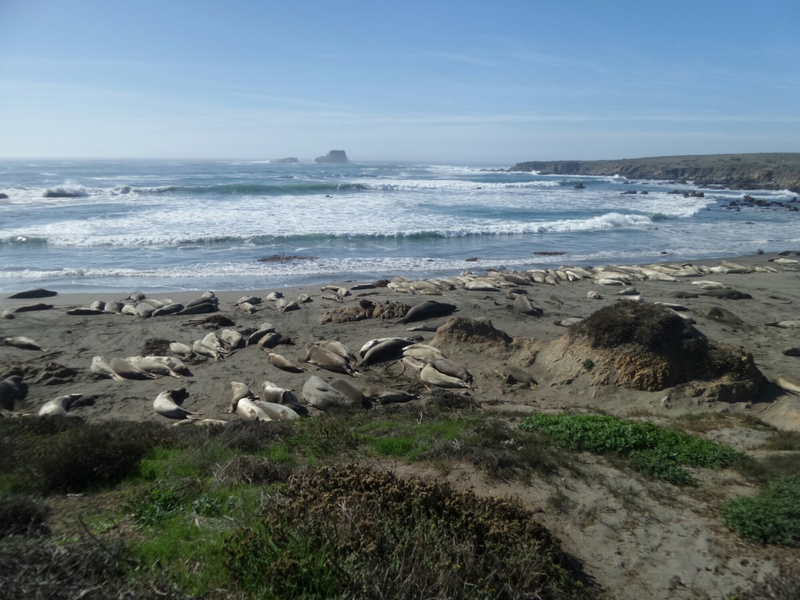 We stopped on the way at a beach where we could see elephant seals, this is a must! There are clear sign posts so you won’t miss it. The beach/lookout point where you see them from also has free wifi- a nice little bonus. It was logging into this wifi where we found out Trump won the election…a surreal moment. Getting back on the road we also saw a couple of fields of zebras… Not quite sure how they got to California! 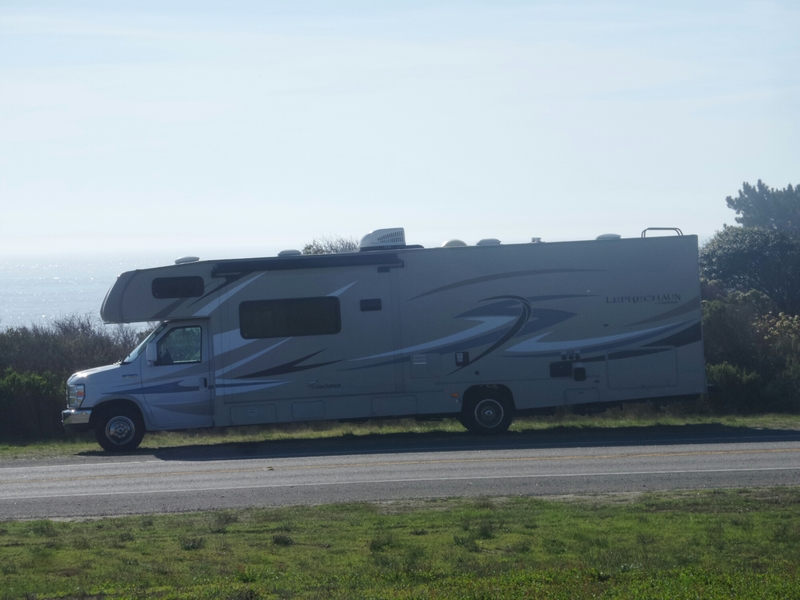 That night we stayed in an RV park called pismo sands. We were really struggling to find somewhere to pull in to stay and were losing light so this was the best option at the time. It was pretty resonable at $50 dollars for the night; full hook up, wifi and acces to the pool and Jacuzzi. We had a lovely time enjoying the jacuzzi and watching the stars. Next morning we carried on heading towards LA. There seemed to be a few stops along the way for RVs to park uo for the night but most you had to pay for and all full anyway. Luckily we found one with some free spaces just south of malibu which was right on the beach, people were swimming and bbq ing, there was a really nice atmosphere. Also we were exempt from the $30 fee as we were leaving so early in the morning and arrived quite late that night (talk to the person on reception nicely and see what they can do for you). Waking up to crashing waves and a rising sun, we set off for our final drive into south LA to hand the RV back. You don’t get much for your $30 as there arn’t any hook ups or facilities…we had an extremely eventful journey attempting to empty the tanks before returning the RV, I won’t tell you too much we’ll have the US authorities after us!